Brendon is the Technical Lead for projects and implementation of the Zero Carbon strategy. Brendon works on a range of diverse projects to identify and explore opportunities for MEFL to drive medium/large scale action on renewable energy and energy efficiency projects. 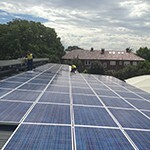 Brendon drives local action on renewables and energy efficiency for Moreland’s Zero Carbon Strategy. Prior to MEFL, Brendon has worked in the energy industry for 20 years throughout Australia and the UK and has excelled at business improvement by analyzing activities to save expenditure, reduce waste, energy costs, and emissions. Techniques used include; Renewable Energy (Photovoltaic (PV), wind, solar, and biomass), over 250 energy audits, data analysis, and project management.